Energy drinks are marketed as drinks that boost mental and physical performance. But how much do you actually know about the way they work? Within the first 10 minutes of drinking an energy drink, you may start to notice a rise in your heart rate and alertness, but it will be around 45 minutes until you are at the point of maximum boost. After an hour or two, depending on your own physiological makeup, you might start to experience a drop in energy levels. This is because the energy boost you experienced will eventually start to wear off. The increase in energy that you experience will generally last 1-5 hours, depending on your body and each energy drink. For regular energy drink consumers, you can become used to your daily caffeine intake. This means that you either don't experience the same level of energy boost that you initially did from a particular energy drink or that you will need to drink more of them to experience the same effects. Red Bull is the most popular energy drink on the planet, selling around 7 billion cans per year. What are the benefits of energy drinks? This one seems pretty obvious, but the main reason that people drink energy drinks is to feel more energetic than they did before drinking one of them. The effect on your energy levels will vary depending on the strength of your energy drink and on your unique physiological makeup. If you're interested to check out some of the strongest energy drinks I compiled a list in this other article. Energy drinks can help to increase mental alertness by improving your brain function. There have been multiple studies that confirm drinking energy drinks can help to improve your memory, concentration and reaction time, while also reducing mental fatigue. In fact, in one study, it was shown that drinking a single can of Red Bull can improve your accuracy, speed and also memory. This one also seems obvious, but it's one of the most important benefits from drinking energy drinks. Energy drinks contain caffeine which increases wakefulness, attentiveness, the ability to focus and your overall energy levels. Drinking an energy drink after your exercise can help you to recover faster. This is due to all the carbohydrates and caffeine that they sometimes contain. During your workouts, you lose electrolytes and energy through your sweat. Some energy drinks can be a great way to replenish the glucose and electrolytes in your body. Besides giving you the energy boost you need, energy drinks also affect your body in a number of ways. Caffeine (a common ingredient in all energy drinks) blocks the effects of adenosine (a chemical in the brain that helps you go to sleep). Caffeine causes causes increased neuron activity, which in turn leads to adrenaline being produced by your body. After the initial "fight or flight" response from the release of adrenaline, your body sends a signal to your liver to excrete more glucose into your bloodstream. Hence the spike in your energy levels. Adrenaline causes your heart rate to quicken. Adrenaline production is a by-product of drinking energy drinks. The increased glucose and dopamine levels in your bloodstream tricks your brain into thinking you have more energy than you really do. Too much caffeine can cause dehydration. If you overdo it, you might be left feeling jittery, anxious or irritable. Depending on the ingredients contained in your preferred energy drink, they might affect you in different ways. We'll take a closer look at some of the most common individual ingredients in energy drinks below. How do the specific ingredients in energy drinks affect your body? The way that an energy drink affects you depends a lot on the individual ingredients contained in the recipe. Caffeine is the most important ingredient in an energy drink that contributes to the effects that you experience. It's definitely true that some energy drinks that are high in caffeine don't give you as much of an energy boost as some that contain less caffeine, but in general, if a drink doesn't contain caffeine it probably won't be all that effective. That being said, I am a firm believer that it's not just the absolute amount of caffeine that matters, rather, the combination of caffeine together with vitamins, taurine, ginseng or other ingredients that all come together to give you the boost that you feel. But just to be clear - caffeine is crucial to an energy drink. Caffeine is fully absorbed into your bloodstream 45 minutes after consumption and lasts for 4-6 hours before all effects have subsided. Most people feel the most energy about an hour after consuming caffeine. Caffeine is a fast acting stimulant, which impart of the reason for its popularity as the worlds most common, and accepted drug. The chemical compounds in caffeine bind to the adenosine receptors in your brain which causes a series of chemical reactions in your body - as already mentioned. In turn, your body produces adrenalin (the fight or flight hormone) which increases your alertness and gives you a burst of energy. Sugar is often what gives energy drinks their sweet taste. But, before writing all energy drinks off, there are plenty of great sugar-free alternatives. Sugar is high in calories and gives your body a short burst of energy. This is because sugar raises the insulin levels in your bloodstream, making you feel energetic. However, the energy that you get from sugar is short-lived it can only give you a short burst of increased productivity). After the initial rush, as the insulin levels in your body begin to drop as it is completely absorbed by your cells, you may start to feel a little lethargic. This is commonly known as a sugar crash and many people who have tried sugary energy drinks might be familiar with this unfortunate phenomena. Consuming sugar can also give your brain a huge surge of the feel-good chemical dopamine. This makes you feel happy, but that feeling will also fade fairly quickly. I'm pretty by now that we all now that too much sugar is bad for you. It's linked to a wide variety of really serious health issues. For these reasons it's probably wise to opt for a sugar-free energy drink instead of one with copious amounts of sugar. There have been plenty of articles highlighting the great health benefits of taurine. Taurine can lower your risk of disease and improve your sporting performances. It's essentially an amino acid (the building blocks of your cells) and your body can produce taurine naturally. Fruit is known to be one of the best sources of B vitamins. B vitamins are nutrients that assume responsibility for the many vital roles in your body. Riboflavin is involved in the breaking down process of proteins, fats, and carbohydrates and plays an important role in maintaining the body's energy storage. It helps our body to convert carbs into adenosine triphosphate (ATP) which produces energy based for our body's needs. Niacin can help to treat psoriasis and reduce your risk of developing non-melanoma skin cancer. It plays an important role in coordinating cells in your body. Niacin is also important in the production and repairing process of DNA cells in your body. It's also known to act as an antioxidant which helps protect your cells from potentially harmful substances. Vitamin B12 plays an important role in keeping your nerve and blood cells healthy. It's also part of the creation process for DNA. Vitamin B12 can help to increase energy levels, especially in people with a vitamin B12 deficiency. Inositol is a type of carbohydrate and plays an important role in our body. Inositol mainly affects serotonin, which has many roles in our body and is associated with our behavior and mood. There have been several studies showing that inositol may help to treat panic attacks and anxiety disorders. In my opinion, if consumed in moderation I don't see why energy drinks are bad for you. However, frequent consumption of energy drinks, especially a huge amount at one go can potentially cause some side effects. This is because energy drinks contain tons of caffeine and sugar. According to the FDA, the maximum recommended daily caffeine intake is 400mg. Further, the maximum recommended daily sugar intake is 38 grams for men and 25 grams for women. A can of Monster energy drink, for example, contains 160mg of caffeine and 54 grams of sugar. A single can puts you over the recommended sugar intake for the day and if you drink two of them, it puts you close to the daily maximum daily dosage for caffeine as well. Consuming too much caffeine may cause side effects such as insomnia, increase heart rate and migraines. Sugar on the other hand as we all know if consumed in large quantities is known to cause diabetes, weight gain, and even premature aging. Of course, Monster is not alone in being high in both caffeine and sugar - there are MANY other energy drinks out there that are in the same category. Fortunately, there are also some good energy drinks that re sugar-free and contain a more reasonable amount of caffeine, without compromising on a great energy boost. What happens when you drink energy drinks every day? Generally speaking, I don't think drinking energy drinks every single day is going to cause you any problems. However, as a precaution, you should probably consider taking some days off from them every now and again. If you do drink energy drinks that are high in sugar and caffeine over a very long period of time, you should expect that it's possible that the side effects of each of those ingredients (listed above) might one day start to cause you some problems. The key is not to overdo it. Drink energy drinks in moderation and you'll be fine, just like anything else. Are energy drink safe to consume? If consumed in moderation and in accordance with the label, energy drinks are perfectly safe to consume unless you have a pre-existing health condition. 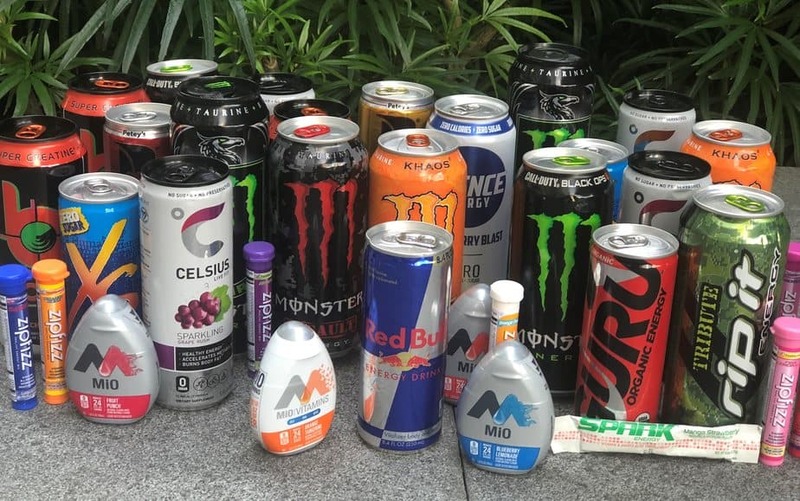 Some brands of energy drinks contain an absurd amount of caffeine and sugar. Those are the ones you'll need to stay clear of, or limit them to occasional treats. Consuming too much caffeine and sugar over a long period of time can be detrimental to your health. If you're looking for the best energy drink, you can check out my article on what's the best energy drinks in 2019. If you looking for something a little bit different, try caffeine pills or Mio water drops which are good alternatives to regular energy drinks. Powdered energy drinks are another great option, and they are more convenient and also more affordable than a lot of the more better-known energy drinks. If you're looking for something that tastes absolutely amazing and contains a sensible amount of caffeine (without the devastating side effects), REIZE might be the energy drink for you. REIZE is home delivered for your convenience. REIZE contains a sensible amount of caffeine, is rich in Taurine, ginseng and B vitamins which are all great for your overall health. REIZE ships right to your door for around $1 per drink, which is a lot cheaper than most other energy drinks. Give REIZE a try today and you might just find that REIZE is the best solution for your daily energy needs. ← Best workout energy drink – Before or during your workout?